Gov. Henry McMaster doesn’t have the authority or the need to remove a Georgetown County Council member from office because he is not a registered voter in the district he represents, according to the governor’s office. 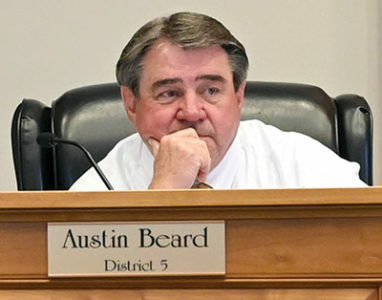 The county Board of Voter Registration and Elections ruled last month that Council Member Austin Beard isn’t properly registered at the address in District 5 shown on his voter registration. The decision followed a challenge filed by the local chapter of the NAACP. Beard has appealed the election board ruling to Circuit Court, where a judge has scheduled a hearing for May 16. The NAACP asked the governor to remove Beard and order a special election. “The circumstances outlined in your letter do not appear to authorize, give rise to, or require any formal action by the governor,” Thomas Limehouse, chief counsel to McMaster, said in a letter to the NAACP last week. He emphasized that his was not legal advice, but Limehouse provided copies of opinions from the state Attorney General’s Office on council residency issues. “We encourage you to raise your concerns in the context of this litigation or to otherwise address such issues directly with the appropriate county officials,” Limehouse said. At the elections board hearing in March, Beard admitted that he had never lived in the house at 510 S. Magnolia Ave. in Andrews that he rented for a one-time payment of $150 in 2016. Health problems led him to live in Georgetown at the home of his second wife, whom he married last year. Beard’s attorney, David Watson, argued that the law only requires an “intent to return.” Beard will also be represented in his appeal by Butch Bowers, a Columbia attorney who specializes in elections and government ethics. He is a former chairman of the state Elections Commission. Update: This story has been updated from the print edition to show a new date for the hearing.